Read for This Week’s Study: 1 Thess. 5:1-11, Gen. 3:15-24, Isa. 13:6-9, Luke 21:34-36, Rom. 1:18. Memory Text: “But since we belong to the day, let us be sober, having put on the breastplate of faith and love, and for a helmet the hope of salvation” (1 Thessalonians 5:8, ESV). Key Thought: The reality of Christ’s return calls us to continual readiness. In this week’s passage, the Second Coming is still the primary theme, but the focus shifts. Here Paul is not so much clarifying details about Jesus’ return as he is proclaiming the need for constant readiness in light of that return (and the judgment that it entails). The previous passage was encouraging; when the end comes, the outcome will be much more positive than the Thessalonians were expecting. Now that they understand better the nature of His return, the question is how to prepare for it. The issue in the church then seems to have been a theology of “peace and security” combined, perhaps, with some members calculating the time of the Second Advent. Through prophecy, the Thessalonians hoped to be able to predict when the final events were coming and, thereby, know when to get ready. As a result, some could have been living without any sense of urgency. Who among us today can’t relate? The longer we are here, the easier it is to lose that sense of urgency. Hence our need to heed Paul’s words here. *Study this week’s lesson to prepare for Sabbath, September 1. Read Genesis 3:15-24. List the various ways that God judged Adam and Eve both positively and negatively in this passage. Though the specific word judgment does not occur in 1 Thessalonians 5:1-11, the passage is very much concerned with it. Paul wants the believers in Thessalonica to be aware that God’s judgment is not limited to something that happens in heaven at the end of time but that it has real consequences for their everyday lives. Many people today are uncomfortable with the theme of judgment. They don’t like the implication of negativity and threat. But the biblical concept of judgment is broader than just threat, condemnation, and execution. There is also a positive side to judgment. Simple everyday actions of mercy and kindness do not go unnoticed or unrewarded (see Matt. 10:42, for example). God sees everything we do, whether positive or negative, and it all has meaning in the ultimate scheme of things. The two-sided nature of judgment is evident in the earliest narratives of the Bible. In the Garden of Eden, God judges the sin of Adam and Eve negatively. There are consequences of sin in relation to childbirth, farming, and where they are allowed to live. At the same time, God judges them positively. He creates enmity between them and Satan and mercifully clothes them with skins so they will not suffer unduly in the changing environment. Even more important, those skins symbolized the righteousness of Christ that would cover their sin, as well. In Genesis 4, God judges Cain negatively by sending him into exile. But Cain also receives a positive judgment. God places a mark on him so that no one will kill him. At the time of the Flood, God judges the human race negatively by way of the destruction of the Flood but also positively by providing the ark as a way of escape (Gen. 6-9:17). In Genesis 11 God mixes up the languages and scatters the human race all over the earth (negative). Where is the positive judgment? It is found in Abraham’s call to be a blessing to “all peoples on earth” (Gen. 12:3, NIV), the same people who were scattered at Babel years before (Gen. 11:9). How does the truth of Christ as our substitute in judgment make that judgment positive for us? Why must we always keep that important truth in mind when we think about judgment? Read 1 Thessalonians 5:1-3 and Acts 1:6, 7. What is the meaning of “the times and the seasons” (NKJV) in these texts? “The day of the Lord” is a phrase found frequently in Old Testament judgment passages. It describes a decisive, “end-time” intervention by God, with a strong emphasis on the negative consequences of disobedience (Isa. 13:6-9, Jer. 46:10, Ezek. 30:2-12). In our passage for today, Paul combines this earlier concept with the thief analogy, which Jesus introduced (Matt. 24:43, Luke 12:39). The three-fold combination of the day of the Lord, a thief in the night, and contractions just before birth all illustrate the same point: The second coming of Jesus will be sudden, unexpected, and inescapable for the wicked. The end time is not the time to prepare for the end. The time for preparation is now. Verse 4 makes it clear, however, that Paul is not scolding the Thessalonians. They already know that the day of the Lord will come like a thief in the night. It is others, those who cry “peace and safety,” who will be surprised by the coming destruction. In Acts 1:6, 7 the disciples of Jesus are asking Him about the timing of the final events of earth’s history. But Jesus does not satisfy their curiosity about these things. The timing of the end is not for them to know. We can see that the phrase “times or seasons” (NKJV) concerns attempts to calculate the timing of the end. Such attempts attract attention, but they are spiritually counterproductive. They cause either disappointment when the calculated time passes or delay in preparation when the anticipated time is too far ahead. What parallels exist between Luke 21:34-36 and 1 Thessalonians 5:1-11? According to Luke 21:34, many people-through such things as alcohol and entertainment-try to escape from spiritual responsibility. Others may be concerned about spiritual preparation for the end but are distracted by the cares and anxieties of life. The suddenness of the end, however, means that the time is coming when there will be no escape for the distracted or the complacent. In the verses that follow Christ’s words in Luke 21:34-36, there is escape for those who watch. How do we live with the sense of urgency, with the awareness of the nearness of Christ’s coming, and yet not get into fanaticism or extremism? How do we strike a right balance? Bring your answer to class. In the opening verses of the fifth chapter, Paul addresses the condition of those who, for whatever reason, are not prepared. The Thessalonians already know that the reality of the Second Coming is certain; only the timing is unknown. The surprise will be tragic for those who are not ready. Some are unprepared because they don’t believe in the Second Coming; others because they think they can delay their preparation until events convince them the end is near. It was late in the 1950s. A young man heard a preacher say that Jesus was coming in 1964, thus the church better get ready. The young man decided that because it was still a number of years off, he wouldn’t bother readying himself until about, well, 1962. In other words, the preacher’s intention to increase the sense of urgency had the opposite effect on the young man. Such delay is perilous, of course, because you don’t know if you will live through even today. The good news is that we don’t need to know when Jesus is coming in order to be ready now. Read 1 Thessalonians 5:4, 5. What is the spiritual meaning of metaphors like light and day, darkness and light? What aspects of your life could be described as light and what as darkness? Think through the implications of your answer. In these verses Paul begins a series of contrasts with day/night and darkness/light (a ruin/rescue contrast is implied in verse 3). Unbelievers will be surprised by the events of the end, but believers will not be surprised. Why? Because they live in the light. The Bible is a “lamp to [our] feet and a light to [our] path” (Ps. 119:105, NKJV). Prophecy is given so that we can have enough information in order to be spiritually prepared for whatever lies ahead. Preparation for the Second Coming involves investing serious time in the Word of God. Preparation is the act of laying up treasure in heaven. Preparation is about a daily surrender to the Lord. There are many distractions in today’s world, from jobs to e-mail to entertainment to a cornucopia of drugs and other mood enhancers. Paul’s appeal comes down to us through the corridors of time. Set distractions aside. Put the Word of God first in your life, and you will not be overtaken by events, no matter how unexpected their timing may be. Read 1 Thessalonians 5:6-8. How does the drunken/sober analogy help us better understand preparation for the second coming of Jesus? Paul begins verse 6 with “therefore” or “so then,” depending on the translation. He has established that true followers of Jesus are children of the light and of the day. In today’s passage he continues the metaphor in order to exhort them to be more and more ready for Jesus’ return. While verse 7 offers a bit of a digression, verses 6 and 8 encourage the Thessalonians to be awake, sober, and armed for the challenges ahead. Paul begins with the contrast of asleep/awake. Because believers “belong to the day” (ESV), they should not sleep, as the night is for sleeping. Paul is writing metaphorically, of course. Sleep here is a metaphor for spiritual laziness or lack of interest (in verse 10 it is a metaphor for death). The expression “let us not sleep” in the original means “don’t even start” sleeping. Paul assumes that they are already awake but encourages them to persevere in watchfulness more and more. Paul then encourages them to be sober rather than drunk. In the ancient world soberness was a symbol for philosophical reason. Paul wants the Thessalonians to be thoughtful and careful in their reasoning from Scripture. Some use the Bible for date-setting and speculation. Paul wants believers to be focused, instead, on the implications of Scripture for their own spiritual preparation. The sober/drunk metaphor may also point back to the kind of ethical restraint he has encouraged in 1 Thessalonians 4:1-12. The daytime is associated with being awake and sober. It is at night that people sleep and, usually, at night when they get drunk. But in verse 8 Paul switches to the imagery of a military guard. Guards need to be awake and sober at all times, day and night. So, soldiers need to exceed the norm when it comes to watchfulness. Paul likewise expects Christians to exceed the norm when it comes to preparation for the Second Coming. And like soldiers, Christians should put on all of their equipment before taking their posts. Take Paul’s words in these texts, as if he were writing specifically and personally to you, and you alone. How would you translate those words into action? That is, what about your life would need to change in order for you to be doing what he says? As we have seen, in 1 Thessalonians 5:1-11 Paul has drawn a series of contrasts to illustrate the two sides of judgment when Jesus returns. In our passage for today (1 Thess. 5:9-11), Paul addresses the contrast between wrath and salvation. Believers can have confidence in the last days because in Christ there is assurance that they are children of the light. Read 1 Thessalonians 5:8-11. What is the essential message in these verses? What is the hope that Paul is talking about, and why can we claim it for ourselves? How is the gospel revealed in these texts? Many today feel that the biblical concept of God’s wrath reflects more the culture of Bible times than the truth about God. That, however, is a misconception. It is true that, in the Bible, God has accommodated His truth to the limits of human language. But the concept of the wrath of God is not limited to the more ancient parts of the Bible; it is widespread in the New Testament, as well, including from the lips of Jesus (Luke 21:23; see also John 3:36), the pen of Paul (Rom. 1:18, 1 Thess. 1:10), and the visions of Revelation (Rev. 6:16, 17; 15:1). So, we cannot safely ignore the concept; it must express something very important about God and the plan of salvation. While we cannot go deeply into the matter here, we must be clear that the wrath of God is not an irrational, impulsive rage. God’s ways are not our ways (see Isa. 55:8, 9). The biblical concept of the wrath of God is more like a nation’s need for justice in relation to lawbreakers who abuse and oppress others. Those who persist in wickedness will be punished and destroyed. Because we have all broken the law of God, we would all be subject to the execution of justice were it not for the life, death, and resurrection of Christ. That is the good news about the wrath of God that shines through 1 Thessalonians 5:8-11. God’s purpose for us is not “wrath” or punitive justice but grace and salvation. And in Christ He has provided the protection we need so that we not experience destruction in the judgment. This is why Paul thought that the wrath of God, rightly understood, was a reason for encouragement rather than fear (1 Thess. 5:11). In Christ, we never need to face God’s wrath because, on the cross, Jesus faced it for us. Further Study: “There is need of watchfulness. Our own hearts are deceitful; we are compassed with the weaknesses and frailties of humanity, and Satan is intent to destroy. We may be off our guard, but our adversary is never idle. Knowing his tireless vigilance, let us not sleep, as do others, but ‘watch and be sober.’”-Ellen G. White, Testimonies for the Church, vol. 5, p. 409. “Some seem to feel that they must be on probation and must prove to the Lord that they are reformed before they can claim His blessing. But . . . Jesus loves to have us come to Him just as we are-sinful, helpless, dependent. We claim to be children of the light, not of the night nor of darkness; what right have we to be unbelieving?”-Ellen G. White, Selected Messages, book 3, p. 150. “The mass of professed Christians . . . are living for the world. Their faith has but little restraining influence upon their pleasures; while they profess to be children of the light, they walk in darkness and are children of the night and of darkness.”-Ellen G. White, Testimonies for the Church, vol. 1, p. 404. “The world, who act as though there were no God, absorbed in selfish pursuits, will soon experience sudden destruction, and shall not escape. . . . Dancing and carousing, drinking and smoking, indulging their animal passions, they go as an ox to the slaughter.”- Ellen G. White, Evangelism, p. 26. In class, ask the question, If Christ were to return tomorrow, would you be ready? Discuss the answers and the reasons given for them. Go over your answers to the question at the end of Monday’s lesson. How do we keep a sense of urgency and yet at the same time function “normally” in society? To what degree has the Adventist focus on the end of time been a positive or negative influence in your life? How have your views on the end time changed over the years? Why is an understanding of the plan of salvation, and justification by faith alone, so crucial to a clear understanding of last-day events? Summary: In 1 Thessalonians 5:1-11, Paul calls for total commitment to readiness for the second coming of Jesus. When we accept the gospel, we become children of the light. As we live out the gospel in faith, hope, and love, we grow more and more into the image of Jesus. If we are ready to die in Christ today, we will be ready if Jesus comes today. I was arrested and jailed for a murder I did not commit. I had been a lay pastor of a little church before I was imprisoned, and I was angry at this injustice. Then a group of Adventists visited the prison, and I heard their message of hope. But I found it difficult to accept the Sabbath. In the same prison was an Adventist man who also had been wrongfully accused of a crime. He encouraged me to follow God’s commandments. I challenged the Adventists to bring me another Bible in another version that clearly stated that the Sabbath is Saturday. Only then would I believe. They brought me a Catholic Bible, which names Saturday as the Sabbath. I thought a long time about the law and the Commandments. If it’s true that the law was done away with, then why am I in prison for a crime I didn’t commit? If the law is done away with, then all the law should have been done away with. It struck me like lightning! The law wasn’t done away with at all, and therefore the Sabbath was still binding. Convinced of this truth, I shared this message with other prisoners and began studying the Bible with others who wanted to know the truth. Some of these prisoners asked to be baptized even before I was. But I hesitated. I wanted to wait until I was freed to be baptized so I could profess my faith as a free man. As I waited for my freedom, I had a troubling thought: What will happen to me if I put off following God and I die? I decided to follow God’s calling and be baptized while I was still in prison. I remained in prison long after I was supposed to be freed. But God used me to lead others to Christ inside the prison. At last I was freed. I became a lay worker under an Adventist pastor. I gave Bible studies, and in five years I led more than 150 people to Christ. One congregation with 30 members worships under a mango tree, for they have no other place to meet. I harbor no ill feelings for those who wrongfully accused me of murder, for if I hadn’t gone to prison I might not have found this wonderful Adventist faith. Your mission offerings support full-time pastors and lay workers as they share God’s love around the world. Thank you. 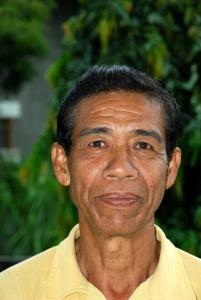 Conrado Andoy, 65, shares his faith in central Philippines.